A student competes in the work climb competition at the TCIAF Student Career Days and Student Skills Competition. Photo: STIHL. The Tree Care Industry Association Foundation (TCIAF) Student Career Days and Student Skills Competition drew around 150 arboriculture, urban forestry and horticulture students from 18 colleges to Charlotte, N.C., Nov. 14-16. 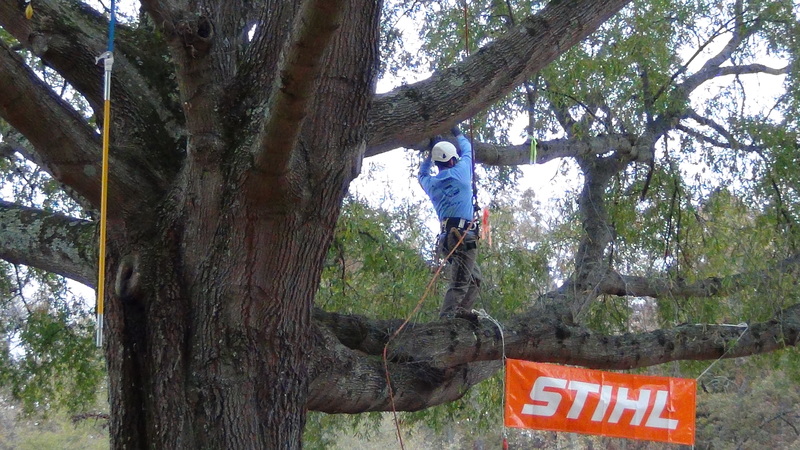 The event was held in conjunction with the TCI EXPO and was sponsored by STIHl, Bartlett Tree Experts, Davey Tree Expert Co., SavAtree, Vermeer Corp., Bandit Industries, Carolina Tree Care and Schneider Tree Care. The Student Skills Competition, held Nov. 15 at Freedom Park, featured the work climb, belayed scramble and throwline competition event as well as academic events, including safety gear check and a knowledge exam. Volunteers from sponsor companies served as judges for the competition. Stephan Moore of Northlands Job Corps Center in Vergennes, Vt. (Men’s Vocational Division). Nov. 16, students met tree care industry employers at a job and internship fair held at the Charlotte Convention Center. 1 Comment on "Students expand tree care skill thanks to TCIAF, STIHL"
What a great opportunity for students. I agree that proper education is important for the next generation of arborists – there’s already far too many out there practising unsafe methods that aren’t entirely environmentally friendly. Let’s hope they’ll be weeded out more and more and property owners will do their research and make sure they hire ISA-certified arborists only.